Daybreak Pacific - 88 min. Cast: Joan Collins, Spencer Breslin, Ralf Moeller, Rachel Hunter, Peter Rowley, Bruce Allpress. Ozzie is a young koala living in Australia. He is kidnapped by two goons (Buzz and Tank) who work for Maxine (Joan Collins), president of Happy Toys. Legend says that Ozzie speaks English and Maxine wants to clone Ozzie into hundreds of koalas and sell them as talking pets. 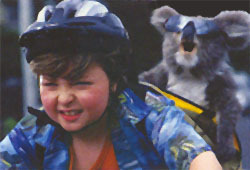 Buzz and Tank lose Ozzie to Justin Morton (Spencer Breslin), an 8 year old who is celebrating his birthday with a trip to Australia. 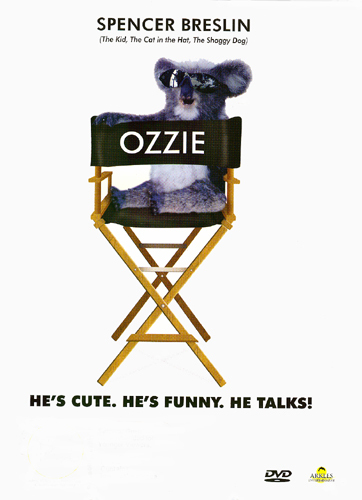 When Maxine finds out the koala is missing, a screwball comedy chase begins as Justin is determined to return Ozzie to his Australian home. A great film for pre-teens. R1 ntsc discs can be found in North America for about $13us. R4 pal versions are available for about $15au or $15nz. There are no extras or subtitles. It is presented 1.75:1, enhanced for 16:9 and with 2.0 dolby digital stereo.